It’s a stormy day here in Belgium with gusts of wind going well over 100 kph/60 mph. Nothing the Tomahawk, the all-weather, twin-engine, twin-rotor heavy lift and troop transit helicopter from the Joe team, couldn’t fly through. I didn’t own the Tomahawk as a kid, but it was one of the first pieces I bought as a collector. 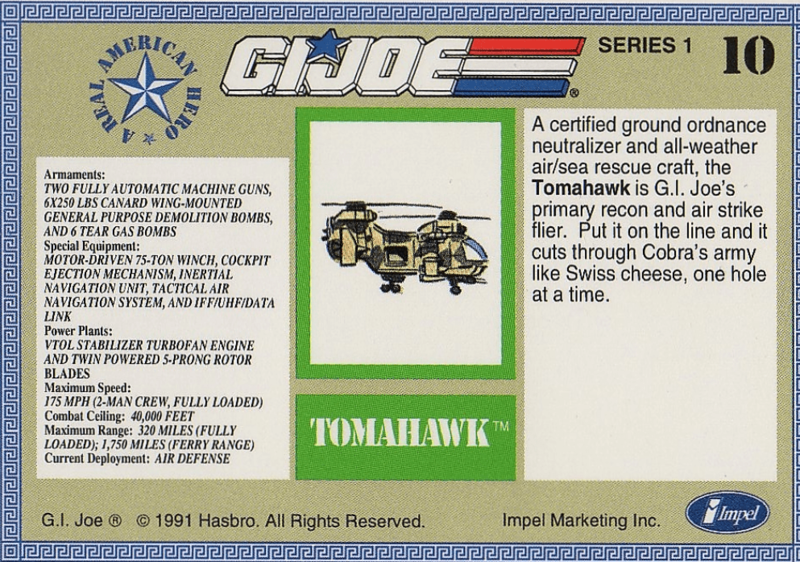 I do remember having a friend who owned both the Tomahawk and the Killer W.H.A.L.E. and I went over to play with my Conquest X-30 and Warthog A.I.F.V. 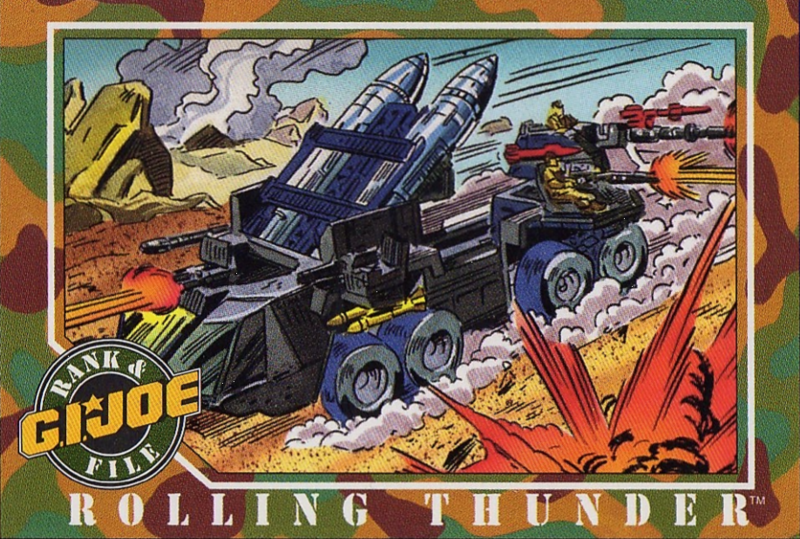 Strangely enough, we didn’t have any Cobra vehicles, but the bad guys always got the chance to hijack one of the Joe vehicles. 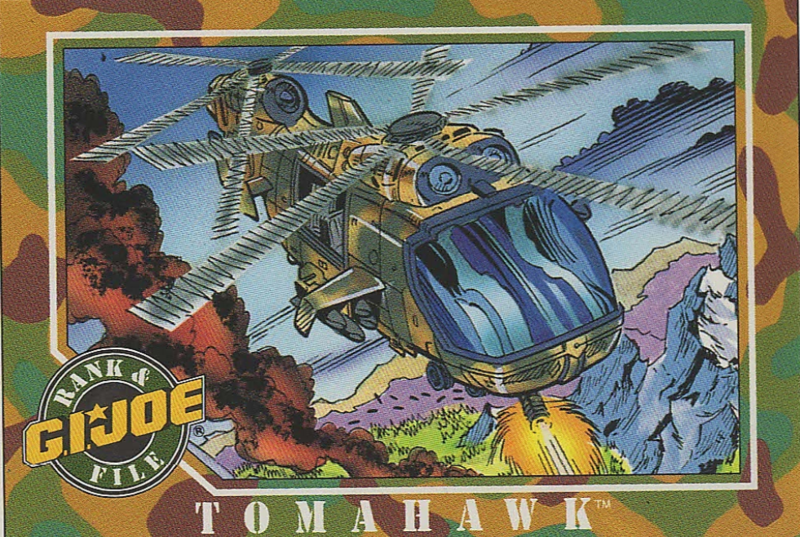 The card art for the Tomahawk is nicely done. It shows the helicopter in mid flight with it’s six-barreled 20mm cannon blazing. Their fire caused serious damage, if you can go on the smoke seen on the left. It’s a shame that there are no figures shown in the cargo area. You can however see the chairs , so nice details. I’ve always been very fond of the Tomahawk (and also the new released Eaglehawk) as it is a very multi-functional vehicle. You can use is as a troop transport, but it can also stand on it’s on in a battle. The story from Special Missions #19 is one of my favorite stories in the Marvel run and shows the Tomahawk in all it’s glory. Like the Joes themsleves, even tough their battered up and tired, they get the job done. Leave a comment if you liked/disliked or want to add your personal thoughts on the Tomahawk. As you all know, I’ve been posting about the 1991 G.I. 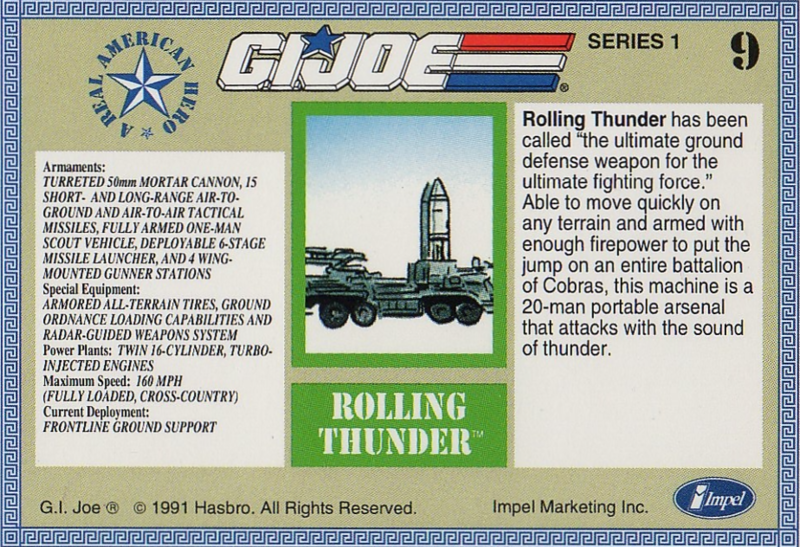 Joe Impel Trading Cards and I plan to explore the other available G.I. Joe trading cards. The bit of exciting news is the fact that there are plans to turn his art into G.I. Joe trading cards. I’m following the developments in this and will post a review here when/if I get my hands on them.